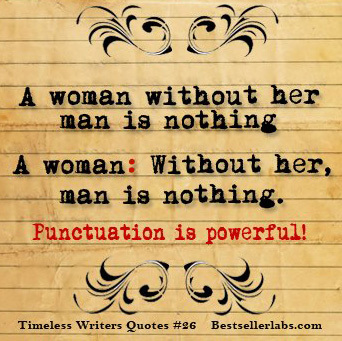 Punctuation is powerful. Which of the following sentences with the exact same words do you agree with? 1 – A woman without her man is nothing. 2 – A woman: Without her, man is nothing. Leave a comment below on which punctuation you like best – #1 or #2. And tell me why. Thanks. Example from Jonathan Gunson of BestsellerLabs.